I founded Emotions in 1997 after I sent out Christmas Cards I made from a photograph of a stained glass window in Switzerland that I had taken on a trip while visiting family there a few years earlier. A friend who received the card asked to purchase some and suggested I sell more of my photography as cards. Since I had a passion for photography, holidays and greeting cards (I collect Victorian Cards) that summer I started Emotions and started selling my photographs as greeting cards. As my cards became more popular another friend encouraged me to give a portion of my sales to my favorite charities which was a wonderful idea. 20% of my profits benefit environmental, pet friendly and humanitarian causes. My photographs are taken from around the world, from such places as the Tahiti, Bora Bora, Switzerland, England, Costa Rica, Germany, Austria, Mexico, Italy, Monaco, Czech Republic, Holland, Norway, France, Hawaii (from around many of our United States) and all around my hometown on the beautiful Central Coast of California. I like to take photographs that have a unique view, that may be colorful, playful, whimsical or serious; of landscapes, animals, food, cars, flowers or trees. You name it, I love taking photographs of it. I enjoy composing my photographs from every day items, such as my images of Gummy Bears, Rubber Ducks or Noodles. 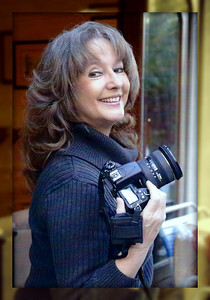 I hope that my photographs will make you smile, evoke fond memories, tell stories or simply entertain you. I've been awarded first prize by the International Library of Photography and have received various other awards and certifications. My work has been used worldwide. My photographs have been used as far away as the Post Office of the Netherlands, by companies as large as Mattel and by television, (a PBS documentary and news stories). My photographs have been used many businesses for advertisements, websites and brochures as well as political campaigns. One of my photographs is featured on a Freeway Sign, on California State Route 1 also known as U.S. Highway 101 coming into Pismo Beach. Most recently one of my photographs was used on Jim Messina's (of Loggins & Messina, Poco and Buffalo Springfield fame) new CD & DVD, "Live at the Clark Center of Performing Arts". I hope you enjoy your journey through my collection of photographs and I welcome your comments and am happy to take special requests. If I don't have an image you are looking for, I will be happy (at no charge) to take photos of your requested image and post them for your pleasure. I'm happy to offer my photography for sale as greeting cards, prints and various gift items through SmugMug. I also offer greeting cards on a wholesale basis and inquiries can be email to me at vivkrug@gmail.com. All photographs ©Vivian Krug and Emotions Photography & Gifts. All rights reserved. Thank you for visiting my site and don't forget to join me on Facebook and Twitter!